The free Phoenix Flies tours begin their second week today. Some of the "fliers" are beginning to recognize each other. "Didn't I see you at Rhodes Hall?" I met the inexhaustible Travis Taylor (who blogs at tourAtlanta) at the First Church of Christ, Scientist tour. It's as if we "fliers" have been given exclusive, insider passes. So it was on Thursday for the tour of Stonehenge, now St. John’s Lutheran Church, one of the Church Mansions of Druid Hills, re-purposed to meet today needs. 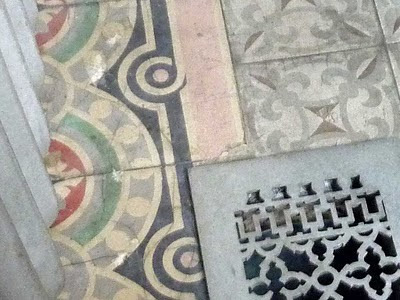 This is the Venetian tile floor of the Sun Parlor, with its perfect 97 year old patina. Samuel Hoyt Venable built Stonehenge with load-bearing Stone Mountain granite because he owned Stone Mountain! "It was built in the Domestic Gothic Style of the Tudor period in 1914." The architect was Edward Bennett Dougherty. Here is the view from Ponce de Leon today. St. John's Lutheran Church bought the mansion on 1959 and added the octagonal sanctuary in 1969. Like octagons or not, the design integrates old and new very well. As many times as I've driven past in the last 40 years, I never thought of it as a mansion. Yet it certainly is. Now this looks like a mansion. The porte-cochere adjoins the Sun Parlor where we started our tour. It certainly looks like a mansion from the back. These windows light the two-story Great Hall. The bank of casement windows lights the 3rd floor. When you enter the front door, you see though to the great hall. Northern light floods the middle of the house. We started the tour in the Sun Parlor. Pastor Brad (Bradley Schmeling) showed us around. The beamed, stenciled ceilings are a great match for the Venetian tile floors. From the Sun Parlor we could peek into the Oriental Room. Look at those paintings. From the Sun Parlor we entered the hall, the Library to the left, the Oriental Room to the right. Here is a look back into the Sun Parlor. What about this column in the library? Most of the "fliers" are now hyperventilating. The Library serves small meetings and devotionals. Next the Great Hall or Pavilion, lit by 2-story windows. ... a stenciled ceiling to please. The Great Hall contains the Grand Staircase. But the stairs themselves aren't the center of attention, the woodwork is. Now to the Oriental Room. Can you imagine a better room for a church meeting? Mr. Leilla Venable Ellis, Sam Venable's sister, is primarily responsible for the paintings. This is the dining room which now contains the kitchen. The fireplace is way above average, huh? The Summer Parlor / Card Room is downstairs, dressed as an English tavern. 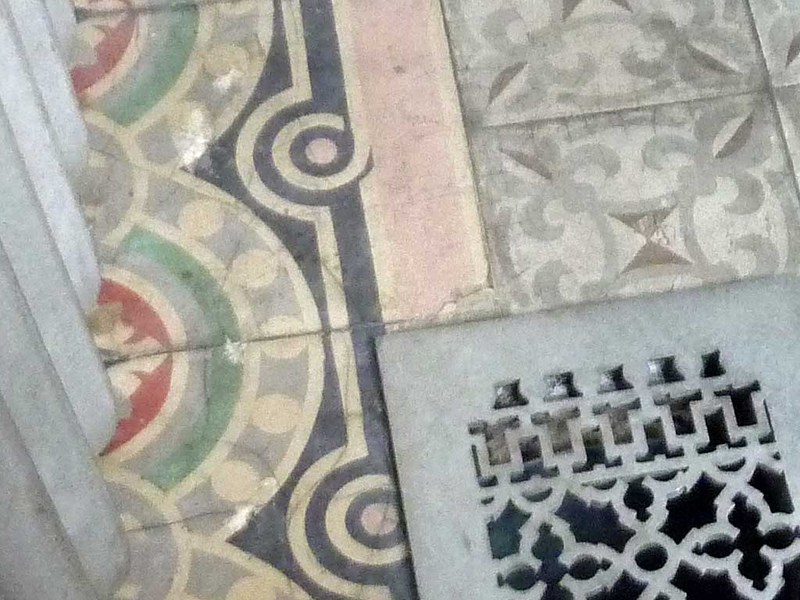 Venetian tiles on the floor. Pastor Brad took us upstairs, to the attic. Mental note: Put a window like this in my next attic. He showed is the real attic too. By this time we "fliers" needed a snack, a massage and a little nap. Why do I like Stonehenge so much? The mansions on Ponce de Leon are Druid Hills' finest. But I fear they are white elephants. The folks who want mansions these days live and build elsewhere. 90 year old houses are tough to manage on any budget. So I'm delighted when these places serve today needs. "...architects and preservationists tend to think that everything we deem “historic” must immediately stop changing, as if the reward for having a great past is to be deprived of a future." "To preserve a building rigorously “the way it came down to us in history,” it seems to me, is a goal appropriate for some, but not all, of the sites that have been deemed worthy of preservation protection. Some places really should be set aside from change, but for thousands of designated sites and in most of our historic districts, a more elastic approach is needed that manages rather than precludes change." So I thank and salute St. Johns. An interesting example of adaptive use, I am glad to see the house so well preserved and respected in regard to the decorative finishes; they are too often covered over for institutional/religious use. Although I would have preferred that the new sanctuary had not tried so hard to outshine the original house, it does at least show some degree of sympathetic acknowledgement. Overall, though, I say it is a success. Thanks for the interesting presentation, Terry! Devoted C, I don't have a particular love for octagon rooms. Pastor Brad said folks were "in you face" sometimes to the good and sometimes not. The thing for me is that I've driven by here for decades and never thought of it as anything but a church. I think that was the aim. The other church mansions still look like mansions even though they've changed their mission. Wow! Thanks so much for the tour. Stonehenge's inside is better than its outside--and its outside is pretty grand. This church reminds me of the churches in Europe. Holy Church Tour! This place is stunning. I like the quotes from Semes. Dougherty had quite a range of styles. Note that the designed Druid Hills Baptist and Druid HIlls Golf Club just down the street from each other. He also designed Boxwood on Springdale. I wonder what more he would have designed had he not moved to Nashville.